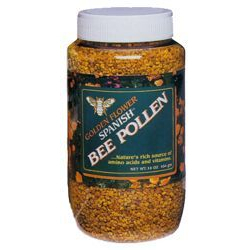 Golden FlowerTM Spanish Bee Pollen. Our Spanish bee pollen is hand gathered, air dried at low temperatures and packed in CO2 flushed containers to maintain freshness and potency. The result is a wonderfully tasty raw pollen, one that contains no preservatives, fillers, additives or insecticides. Our Spanish bee pollen is a rich source of many essential nutrients including vital amino acids-the building blocks of protein. Because our Golden FlowerTM Bee Pollen is not processed or heated, the full, healthy complement of vitamins, minerals, trace elements carbohydrates and enzymes is maintained for its nutritional value. Many people take our Golden FlowerTM Bee Pollen prior to exercising or working out for energy enhancement while others use bee pollen as a nutritional supplement to support general well being. One word of caution: Because people with pollen sensitive allergies may find bee pollen aggravating, start with smaller amounts such as testing a few granules. One jar contains 16 oz. (454 grams) of imported Spanish bee pollen granules or 64 servings per container. Recommended serving size is 2 teaspoons or 1/4 ounce.